The fifth in a series of Research-to-Impact briefs by Chapin Hall at the University of Chicago on understanding and addressing youth homelessness. In Voices of Youth Count’s first Research-to-Impact brief, researchers estimated that nearly 4.2 million youth and young adults in America experienced some form of homelessness during a 12-month period. Missed Opportunities: Youth Homelessness in Rural America highlights research related to the specific experiences of young people who reside in the vast areas of the country that have fewer people and more widely dispersed services. The findings show that rural youth homelessness is just as prevalent as homelessness in urban areas. However, in rural areas, youth experiences of homelessness are more likely to be hidden, and these youth face unique challenges accessing education, jobs, services, and support. Jesse, a 21-year-old white male living in Walla Walla County, Washington, was one of 215 young people who participated in the Voices of Youth Count in-depth interviews. Walla Walla County is home to 60,000 people and sits against the state’s southeastern border with Oregon. Jesse identified his housing instability as starting at age 18, when his mental health began to deteriorate. His first episode of homelessness occurred when his adoptive mother found syringes in his bedroom and kicked him out. This Research-to-Impact brief is the fifth in a series that draws on multiple research components from Voices of Youth Count. Adolescence and young adulthood represent a critical developmental window. Every day that young people like Jesse experience the stress of housing instability represents a missed opportunity to support healthy development and transitions to productive adulthood. Voices of Youth Count elevates the voices of young people like Jesse across our nation who lack the necessary support and resources to achieve independence and make unique contributions to our society. Throughout this brief, we raise new evidence on the distinctive issues of youth homelessness among America’s vast landscape of rural communities. Given the lack of nationally representative data on youth homelessness in America and the bias of youth homelessness research toward cities, the understanding of the scale and circumstances of youth homelessness in rural America is limited. The Voices of Youth Count research is a significant step in closing the knowledge gap. What makes a place rural? The answer isn’t as straightforward as you might think. There is no single, widely accepted definition of a rural community. Different surveys, agencies, policies, and programs classify areas as rural based on a range of characteristics, such as population size, population density, household density, resident interpretations, and the presence of (or distance from) metropolitan areas. For example, the U.S. Census Bureau defines counties as rural if more than half of the county’s population lives outside of urban areas. About 60% of all U.S. counties, which collectively encompass 14% of the nation’s population, meet this criterion. This encompasses 72% of the U.S. land mass. Recently, for the Youth Homelessness Demonstration Program (YHDP), the U.S. Department of Housing and Urban Development (HUD) defined rural counties more broadly. The current definition includes counties that are predominantly rural, that lack significant urban areas, or that are located in very rural states; under these criteria, 75% of U.S. counties are defined as rural. For the National Survey analysis, we use the U.S. Census Bureau classification for rural counties unless indicated otherwise. In other cases, we simply differentiate counties as having relatively small, medium, or large population sizes so that readers can see how features of youth homelessness vary along a rural-urban spectrum. Chapin Hall’s Youth Counts compare six counties with relatively small population sizes to seven with medium-sized populations and nine with large population sizes. Our in-depth interviews with young people, which were conducted in five counties, included one of the six small counties*, Walla Walla County, WA. Although these six counties had relatively low population sizes, three of them, including Walla Walla County, do not meet the U.S. Census Bureau’s definition of a rural county. While the specific definition of rural can differ, the communities we describe as rural share many attributes in common, including fewer people spread over a larger landscape, less access to services and economic opportunities, and greater hiddenness of social problems like homelessness. • Youth homelessness is as common in rural counties as it is in nonrural counties. • Youth experiencing homelessness in rural counties were more disconnected from education and employment than those in larger, more urban counties. • In rural communities, changes like the collapse of an industry or the emergence of a substance use epidemic can have profoundly destabilizing effects on disadvantaged families, which, in turn, can shape young people’s trajectories into homelessness. • American Indian and Alaska Native youth have more than double the risk of homelessness as other youth, although most were located outside of rural communities. • Most rural counties lacked services designed specifically for youth experiencing homelessness, forcing young people to go without help or travel to distant locations to seek support. 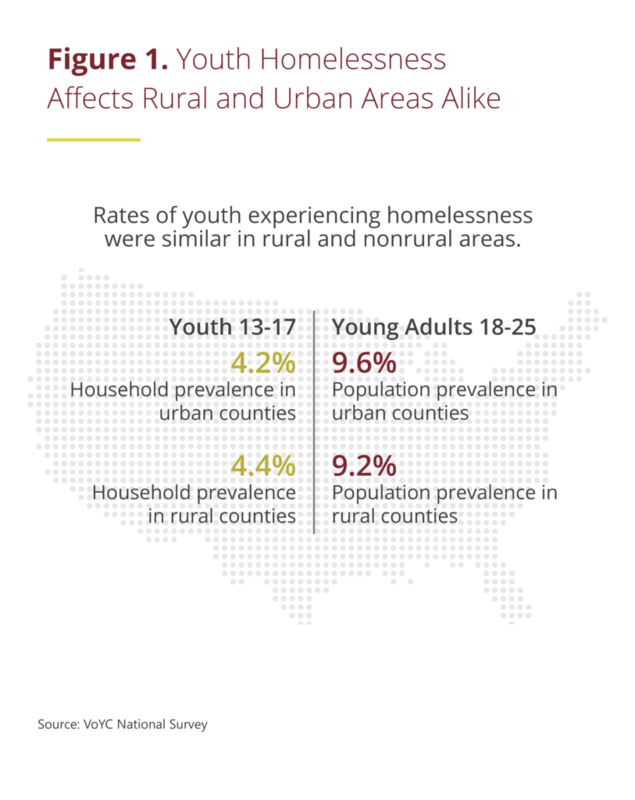 These key findings signal opportunities to develop policy actions and community responses to prevent and address the hidden challenge of youth homelessness across rural America. As a nation, we are missing opportunities to ensure that all young people can reach their full potential and contribute to stronger communities and economies across the country. Voices of Youth Count’s Systemic Evidence Review (brief forthcoming) includes the most comprehensive synthesis to-date of evaluations of interventions to prevent and address youth homelessness. Among all of the evaluations we identified, none had specifically tested the impacts of programs or practices in rural contexts, though many explicitly assessed interventions in urban areas. The overall lack of evidence of what works in supporting young people in rural contexts limits our ability to identify effective programs or practices to serve them. This matters. Different program models (or, at least, implementation approaches) may be needed in rural communities. There are unique challenges associated with delivering interventions in rural areas due to limited service infrastructure, greater remoteness, widely dispersed populations, and the unique economic, political, and social realities of rural communities. However, our research highlights critical systemic changes that can be made today to better address youth homelessness in rural America. Voices of Youth Count identifies implications and recommendations for policymakers, leaders of public systems, and practitioners to make change for and with youth who experience homelessness. We intend for these recommendations to serve as the beginning, not an endpoint, of a conversation about tangible improvements to the nation’s laws, regulations, systems, and programs. Voices of Youth Count speaks to the evidence while seeking solutions. • National Survey: A nationally representative phone-based survey of 26,161 adults about homelessness and couch surfing among youth and young adults in their households during the past year and follow-up interviews with a subsample of 150 respondents who reported any youth homelessness or couch surfing. 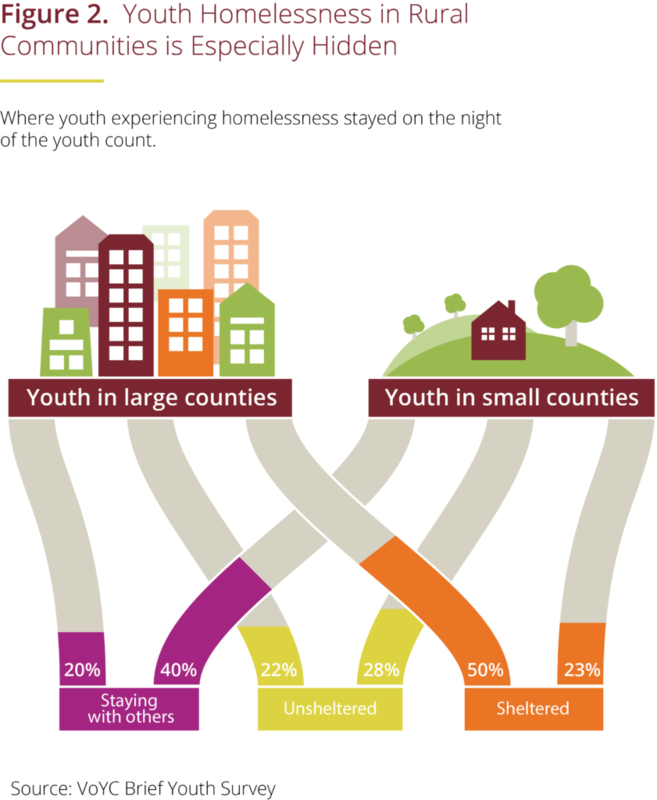 • Youth Counts & Brief Youth Survey: A brief youth survey of 4,139 youth experiencing homelessness conducted in conjunction with point-in-time counts in 22 counties across the country. • Continuums of Care & Provider Survey: Surveys of 523 diverse service providers and 25 Continuum of Care (CoCs) leads in the 22 Youth Count counties. • In-depth Interviews: Detailed qualitative and quantitative interviews with 215 young people experiencing homelessness in five of the 22 Youth Count counties. • Administrative Data Analysis: Analysis of administrative data from multiple sources including the Homelessness Management Information System (HMIS) that all HUD-funded homeless services agencies and organizations are required to use; OrgCode, Inc. intake assessment and homelessness systems data; U.S. Department of Education data on student homelessness; and data from the Foster Care Data Archive—a longitudinal data warehouse containing records for children in over two dozen states who spent time in foster care. • Systematic Evidence Review: A comprehensive synthesis of evidence on programs and practices from evaluations of interventions to prevent or youth homelessness or improve the outcomes of homeless youth. • Policy & Fiscal Review: Analysis of statutory and regulatory entry points for policy action on youth homelessness and group discussions with 25 stakeholders representing youth-serving systems including child welfare, juvenile justice and education from five of the 22 Youth Count counties. This brief elevates key findings and implications on rural youth homelessness for a broad audience from the range of these research components. We do not give technical detail on methods or results here, but technical information can be found in Voices of Youth Count research papers and reports that have been and will be published. These are posted on www.voicesofyouthcount.org. Reexamine federal programs and funding to ensure that young people in every part of the country have access, within a reasonable distance, to youth-specific homelessness services and supports. See Findings 1 and 3. Establish ongoing grant programs and technical assistance to address youth homelessness in rural communities. See Findings 1 and 3. Supplement shelter- and street-based counts, especially in rural areas, with creative methods to identify and count the full range of youth experiencing homelessness. See Finding 2. Add a priority focus for youth experiencing homelessness to the U.S. Department of Agriculture (USDA) Rural Youth Development Grant program and Rural Community Development Initiative. See Finding 2. Develop trauma-informed toolkits for rural youth through the Substance Abuse and Mental Health Services Administration (SAMHSA). See Finding 2. Provide funding to support innovation and rigorous evaluation for tailored housing and service delivery models for youth in rural communities. See Finding 3. Engage tribal nations, organizations, and young people to devise concrete, culturally sensitive federal policy strategies for both rural and urban communities to address the high risk for homelessness among American Indian and Alaska Native youth. See Finding 4. These similar rates might defy common perceptions of where homelessness exists. We found similar rates of youth homelessness among young adults ages 18-25 in rural (9.2%) and urban (9.6%) communities. Among adolescents ages 13-17, household prevalence of some form of homelessness was 4.4% in rural and 4.2% in urban counties.2 While white youth are in the majority of the population overall as well as within the subgroup experiencing homelessness, black and Hispanic youth in rural communities still experienced homelessness disproportionately. Although prevalence rates of youth homelessness are similar across rural and non-rural communities, the numbers of youth experiencing homelessness are smaller in rural communities because the population sizes are smaller in these communities. The different definitions of “rural” make it challenging to definitively estimate how many “rural youth” experience homelessness. Applying the more narrow Census Bureau definition produces a rate of 9% of young adults reporting homelessness among rural counties. Congress has appropriated two rounds of YHDP funding for HUD to award competitive grants to CoCs for innovative, coordinated responses to youth homelessness involving multiple systems and services. Using the YHDP criteria for a rural county under the second round of funding, the share of young adults residing in rural communities reporting homelessness increases to 17% (about 1 in 6). While the definition of a “rural” community can significantly alter the number of young people implicated, the evidence is clear that rural youth struggle with the challenges of homelessness as much as urban youth do. • 40% lived in zip codes with population densities of more than 3,000 people. These findings underscore the importance of tailoring strategies for the identification, outreach, and service delivery for young people in less densely populated areas who might otherwise not get the attention they need. CoCs and other public systems can use this information for planning purposes. Federal programs and funding must ensure that youth in every part of the country have access, within a reasonable distance, to youth-specific homelessness diversion, housing, and supports. The findings make clear that youth homelessness is truly a national challenge that affects rural, suburban, and urban communities alike. Any rural community that lacks strategies and services to prevent and address youth homelessness is likely a community with unmet needs and missed opportunities. Federal programs and funding geared to addressing youth homelessness should aim to create equitable opportunities for communities across the spectrum of population density to benefit from those resources. Federal policy for youth homelessness could emulate the targeted programs and technical assistance provided to rural communities through other federal initiatives. For example, recognizing the unique challenges to health care access and service delivery in rural parts of the country, the U.S. Department of Health and Human Services (HHS) administers the Rural Health Care Services Outreach Program and the Rural Health Information Hub. These are grant and technical assistance programs aimed at promoting rural health care services through enhanced delivery. Focused federal efforts could similarly provide much-needed financial and technical assistance to rural communities combating youth homelessness with unique delivery challenges. Given the significant unmet need in urban communities, however, any new rural-focused resources and supports should supplement those extended to urban communities, not shift resources from them. For HUD’s YHDP funding, a certain number of grantees had to be rural communities, and HUD’s criteria for a rural community were broadened under the second round of funding. These are positive steps to help more rural communities access resources. Moving toward ongoing, rural-focused financial support and technical assistance, such as the rural health care example mentioned above, can usefully build on these developments. Similarly, HHS offers two programs that, if continued, evaluated, and expanded, could bolster resources for rural communities. The Basic Center Program (BCP) provides short-term shelter, family intervention, and support services for runaway and homeless youth. The Street Outreach Program (SOP) includes outreach and drop-in services at the front lines for youth experiencing homelessness. Innovative responses like rural host homes (BCP) and mobile and technology-based outreach (SOP) might improve supports in rural contexts. Given the unique circumstances of rural communities, federal funding may be more effective by investing in flexible housing arrangements and vouchers, transportation, counseling, education, and aftercare plans instead of, or in addition to, traditional shelter facilities. Further, a stronger partnership between HUD and HHS on rural youth resources and tools would help communities maximize federal resources. Youth homelessness in rural communities is especially hidden. The Voices of Youth Count team conducted brief youth surveys across 22 counties within point-in-time counts. Compared with youth in counties with larger populations, youth in small population counties were twice as likely to be staying with others and about half as likely to be staying in shelters. Youth in small counties were also more likely to be sleeping outside. Specifically, on the night of the count, in large counties, 20% of youth were staying with others, 22% were unsheltered, and 50% were sheltered. By comparison, in small counties, 40% reported staying with others, 28% were unsheltered, and 23% were sheltered. Jesse’s reliance on the streets and couch surfing in Walla Walla County exemplifies these trends. In large counties, half of the youth surveyed were staying in shelters or transitional housing on the night of the count. This underscores the extent to which reliance on services drives identification and count estimates in urban areas. In rural communities, where youth shelter services are generally lacking, youth experiencing homelessness don’t have such places to congregate and are thus less visible. Given this higher degree of “hiddenness” in rural communities, administrative data and traditional point-in-time count methods may have a greater risk of underestimating the extent of youth homelessness in these areas. Issues specific to rural areas can influence young people’s journeys into and through homelessness. Previous research showed that poverty rates are higher in nonmetro areas. Rural communities also offer fewer economic opportunities for young people to generate sufficient income to escape poverty and sustain housing stability. The lack of economic opportunities may be a stronger factor in driving homelessness in these communities than in urban ones. According to our brief youth surveys, 57% of youth ages 16-24 who were experiencing homelessness in small counties were neither attending school nor employed, compared to 46% of youth in large counties. The same survey revealed that 23% of young adults ages 18-25 who were experiencing homelessness in small counties were employed, compared to 35% of peers in large counties. Youth in small counties were also more likely to have been in juvenile detention or prison or jail than those in large counties (52% vs. 43%). These experiences further hinder young people’s access to jobs and housing. While these indicators are concerning for all youth experiencing homelessness, they suggest an especially high level of disconnectedness from education and economic opportunity among rural youth. While trauma, childhood adversity, and family instability and conflict were key drivers of youth homelessness in general, the VoYC interviews in Walla Walla County revealed how such challenges can easily affect entire rural communities. For example, the closing of food canning factories marked a structural jobs transition in Walla Walla. The closures disproportionately affected low-income households and fueled family instability and tensions. Relatedly, a substance use problem gripped much of the socio-economically disadvantaged segments of the county and further frayed family safety nets. These community-level forces played prominently into the Walla Walla youth trajectories into homelessness. Rural communities need resources and guidance to employ more creative approaches to identifying and counting youth experiencing homelessness. HUD estimates of people experiencing homelessness rely heavily on shelter and street counts. In rural communities, shelters are generally scarce, particularly for youth. As a result, people who experience “literal homelessness” (i.e., staying in places not meant for human habitation) can be dispersed and hidden (e.g., in vehicles and campgrounds). Traditional count methods can be supplemented by creative identification approaches such as greater collaboration with schools, colleges, other public systems, faith-based organizations, and community service organizations to reach and survey youth. Well-advertised magnet events can also be used to attract youth to specific places to participate in surveys about their housing situation. In addition, when feasible, population-based representative surveys such as those used for the VoYC National Survey can capture a fuller picture of youth homelessness and housing instability. Youth who experience homelessness, or are at risk for homelessness, need real opportunities to develop skills and careers. The USDA Rural Youth Development Grant program and Rural Community Development Initiative can use the VoYC findings to forge stronger connections to youth experiencing homelessness and support their career development. We recommend that USDA prioritizes a community economic development approach that includes training and sustainable employment opportunities for this population of young people. Additionally, Federal Workforce Innovation and Opportunity Act state plans should include targeted approaches for youth experiencing homelessness in rural communities. Strengthen the rural public health system’s ability to address the trauma, substance use, and mental health issues that touch the lives of young people. SAMHSA has resources related to homeless populations overall. However, our findings provide an impetus to tailor those resources to the unique challenges facing youth experiencing homelessness in rural settings. Toolkits—including practical, evidence-based resources and capacity-building materials—for trauma-informed practices with this population would help communities use evidence-based practices across all of their services. There is a stark shortage of programs serving runaway and homeless youth in rural counties. The VoYC provider survey conducted in 22 counties found very few runaway and homeless youth service providers in the small population counties. Half of the six small counties had no programs specifically for runaway and homeless youth, and the remaining only had one or two programs. In general in these counties, broader youth service organizations were the primary service entities for youth experiencing homelessness. None of the small counties indicated any host home or rapid rehousing programs for youth while several medium- and large-sized counties noted at least some instances of these programs. Additionally, the small counties did not report any drop-in centers for youth experiencing homelessness (unlike medium- and large-sized counties), yet these types of services can function as essential access points for youth experiencing homelessness and connect them to a wider array of services. A lack of services and programs tailored to address youth homelessness shapes young people’s struggles with housing instability. In-depth interviews revealed how youth in Walla Walla County faced a community context in which many of the critical supports and resources participants needed were located outside of the town of Walla Walla and, in some cases, outside of the state. Consequently, these youth faced the highest rates of staying in unsheltered places compared to participants in the other four counties (medium/large population; 85% vs. 67%) where we conducted in-depth interviews. For young people in Walla Walla, the contours of their trajectories into housing instability were uniquely shaped by the lack of a robust formal service system and the distance to services. Support innovation and rigorous evaluation of tailored housing and service delivery models that serve youth experiencing homelessness in rural communities. The VoYC results demonstrate a significant lack of runaway and homeless youth programs in rural counties. Addressing this service gap requires experimenting with and testing creative approaches that address service gaps in remote and less populous parts of the country. For example, one solution could be to test and expand the use of host home programs. These programs match young people with caring host families, providing additional support to help them find stable housing. Such initiatives may be especially useful in less densely populated areas where youth may otherwise have to travel significant distances to access shelter. Similarly, scattered site longer-term housing options and rental assistance could provide wider spatial coverage in rural communities than programs that house and support large groups of young people in one building. Dispersed drop-in centers for youth, roaming youth outreach workers, and navigators could also make accessing homeless services and systems easier for young people in rural areas. Such approaches offer promise for preventing youth homelessness and supporting sustainable exits from homelessness, but federal and philanthropic investments are needed for evaluation to accompany creative experimentation. The VoYC results demonstrate a significant lack of runaway and homeless youth programs in rural counties. Addressing this service gap requires experimenting with and testing creative approaches that address service gaps in remote and less populous parts of the country. School systems can play a leadership role in rural communities, identifying and supporting young people who are experiencing, or at risk for, homelessness. Schools can introduce more robust identification strategies and early warning systems, develop school-based support services, and establish strong links with available community services. School truancy policies should take into account the challenges that young people experiencing homelessness face with respect to school attendance, and focus on supportive rather than punitive approaches to chronic absenteeism. Cross-agency partnerships are needed to reach youth in rural communities. Because infrastructure built specifically to serve youth experiencing homelessness does not exist in many rural communities, the organizations that do exist—broader youth-serving organizations, faith-based organizations, child welfare systems, schools, colleges, etc.—have an opportunity to work together to weave a robust safety net for these young people. 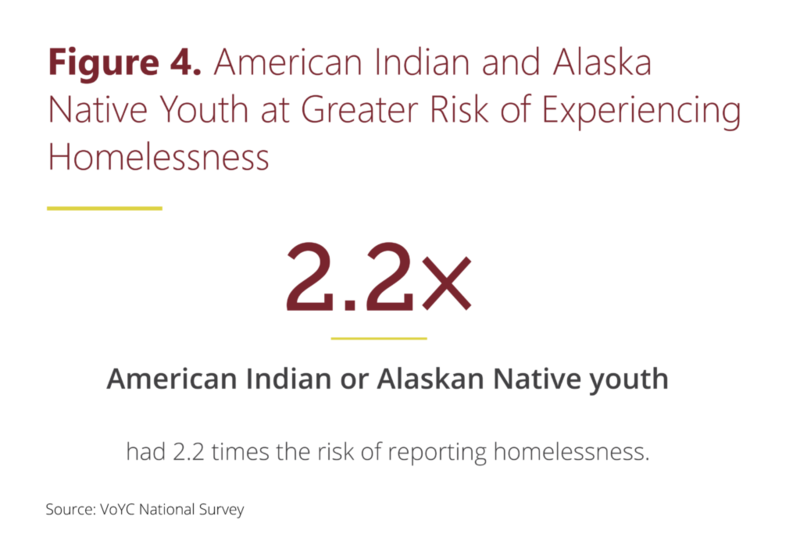 Our national survey found that American Indian and Alaska Native young adults had more than twice the risk of explicit homelessness in the last 12 months as other young adults. During a 12-month period, approximately 9.0% of American Indian or Alaska Native households with 13- to 17-year-olds reported explicit youth homelessness and 1.6% reported experiences that solely involved couch surfing without a stable living arrangement, or 10.6% overall. For 18- to 25-year-old American Indian or Alaska Native young adults, the 12-month population prevalence estimates were 10.7% for explicitly reported homelessness, 4.6% for couch surfing only, and 15.3% overall. American Indian and Alaska Native young adults had 2.2 times the risk of experiencing homelessness compared to other young people (and three times the prevalence rate of homelessness as white, non-Hispanic peers). These rates were somewhat higher than the prevalence rates found among African American or black young people4 and underscore the substantial vulnerability of American Indian and Alaska Native youth. The findings mirror similar trends related to poverty and other deprivations showing American Indian and Alaska Native populations with some of the worst indicators among racial and ethnic subgroups.5 Characteristics like low household income, low educational attainment, identifying with more than one race, and parenting status (especially among unmarried youth) were all associated with higher risk for homelessness among American Indian and Alaska Native young adults. These figures contrast with a common, outdated perception of American Indians or Alaska Natives residing primarily in rural reservations. While in 1930 only 10% of the American Indian population lived in urban areas (compared to over half of all Americans), various social, economic, and policy factors have since contributed to the major urban migration of tribal peoples.8 Yet, American Indian and Alaska Native young people residing off reservations and in urban areas are much less likely to have access to the small number of federal resources designated for American Indian or Alaska Native peoples, which are mostly available on reservations. The dispersion of American Indian and Alaska Native young people in urban areas also adds to the difficulties of targeting homelessness prevention and response strategies for this high-risk subpopulation of young people. Investment in tailored, culturally responsive homelessness prevention strategies and housing resources are critically needed for American Indian and Alaska Native young people. Specific intervention strategies should be devised for both rural reservations, where some American Indian and Alaska Native young people are concentrated, as well as for the large majority of American Indian and Alaska Native young people who are dispersed across urban and suburban communities. Because these youth would comprise small minorities in urban areas, they are likely to be more hidden and overlooked. The U.S. Bureau of Indian Affairs (BIA), in partnership with the U.S. Interagency Council on Homelessness (USICH) and other relevant federal agencies, can use the VoYC findings to engage the expertise of tribal nations and work together to develop a roadmap for ending homelessness for American Indian and Alaska Native young people. Further, the experiences of American Indian and Alaska Native young people are understudied, and additional research can inform successful intervention strategies. Young people experiencing homelessness in rural communities face a unique set of challenges. The hurdles range from a lack of access to basic youth-centric services and housing options to destabilizing factors at the community level, such as economic transitions and drug epidemics. In spite of these difficulties, young people like Jesse demonstrate resilience and resolve. Jesse’s strong desire to improve his situation meant resorting to sleeping on the streets to avoid the substance use triggers he confronted while staying in others’ homes. Yet our findings also make clear that young people’s resilience needs to be matched by adequate support. This is far from the current reality in rural communities. Some young people need access to short-term housing during a crisis; others need long-term housing and intensive service options to regain stability. Customizing the design and delivery of such housing models for less densely populated areas spread over broader terrain is critical. It is also important to tailor outreach strategies to better identify and support rural youth whose homelessness experiences can be especially hidden and transient. With fewer formal resources available, helping rural young people build positive connections to caring adults who they can rely on—inside or outside of their families—may be especially important. Rural areas are especially hard hit by social and economic change. For many of these young people to sustainably exit homelessness, access to evidence-based behavioral health and employment supports that respond to the unique and changing contexts of rural communities must be integrated into service plans. Finally, engaging families early and effectively with economic, parenting, and behavioral health supports could prevent the escalation of difficult situations into homelessness. Key findings and common themes emerged from this brief that require collective action from all levels of government, from public systems, and from local community leaders and organizations. Together, we can end youth homelessness in America. And we can get there faster by tailoring strategies to specific types of communities and marginalized populations. We owe it to young people like Jesse, and we owe it to our nation’s future. Continuum of Care (CoC): A regional or local planning body that coordinates housing and services funding for homeless families and individuals. Explicit homelessness: This refers to survey respondents who used the term “homeless” to describe youth experiences. For 13- to 17-year-olds, it also includes reports of having run away from home, or having been kicked out, and staying somewhere else for at least one night. Homelessness: Generally refers to experiences of sleeping in places not meant for living, staying in shelters, or temporarily staying with others (“couch surfing”) while lacking a safe and stable alternative living arrangement. Voices of Youth Count looks at unaccompanied homelessness, meaning the youth is unaccompanied by a parent or guardian while homeless. Population density: This refers to the population per square mile of a defined geographic area. Rural county: According to the U.S. Census Bureau, rural counties are those in which at least half of the county’s population lives outside of classified urban areas. We use this designation for some national survey results, but in some cases (where indicated) we include a somewhat broader HUD definition of a rural county from the Fiscal Year 2017 Youth Homelessness Demonstration Project. Small county: We use this designation for the six Youth Count partner counties with the lowest population sizes, which ranged from 15,028 to 119,980. Three of the six partner counties meet the U.S. Census Bureau’s criteria for a rural county. Youth: Varying age ranges are used for youth throughout the world. The most common range internationally is 15-24. We use the age range of 13-25 to align with the Runaway and Homeless Youth Act age range for national estimates, but we refer to two specific subgroups: adolescent minors (ages 13-17) and young adults (18-25). Youth Homelessness Demonstration Program (YHDP): This HUD initiative awards funding and technical assistance to communities on a competitive basis to develop and implement coordinated plans to reduce the number of youth experiencing homelessness. 1. Such as those delivering after-school programs, youth centers, mentoring programs, faith-based programs, and other activities that are not specific to youth homelessness. 2. Because the survey did not interview minors directly, we can only calculate the prevalence of households with 13- to 17-year-olds that reported youth in that age group experiencing homelessness. For young adults, ages 18-25, we have self-reported information and can calculate population-level prevalence, not just household prevalence. 3. Brown, J. D., Goodin, A. J., & Talbert, J. C. (2018). Rural and Appalachian disparities in neonatal abstinence syndrome incidence and access to opioid abuse treatment. The Journal of Rural Health, 34(1), 6-13. 4. See the first VoYC brief, Missed Opportunities: Youth Homelessness in America: National Estimates, for previously reported evidence on the high disproportionality of homelessness among black and multiracial youth. 5. Macartney, S., Bishaw, A., & Fontenot, K. (2013). Poverty rates for selected detailed race and Hispanic groups by state and place: 2007–2011. American Community Survey Briefs. Washington, DC: U.S. Census Bureau. Available at: https://www.census.gov/prod/2013pubs/acsbr11-17.pdf. 6. The difference was not statistically significant. 7. Norris, T., Vines, P.L., & Hoeffel, E.M. (2012). The American Indian and Alaska Native Population: 2010. Washington, DC: U.S. Census Bureau. Available at: https://www.census.gov/newsroom/releases/archives/2010_census/cb12-cn06.html. 8. National Research Council & Committee on Population. (1996). Changing numbers, changing needs: American Indian demography and public health. Washington, DC: National Academies Press. This brief is the result of a collaboration between Voices of Youth Count, based at Chapin Hall at the University of Chicago, and many partners. The authors wish to acknowledge important contributions from Elizabeth Dierksheide, Richard Epstein, Anne Farrell, Beth Horwitz, Marrianne McMullen, Bryan Samuels, and Michael Stiehl, as well as the methodological and technical expertise provided by the Voices of Youth Count Technical Advisors. Data collection for the national survey and follow-up interviews was conducted by Gallup, Inc. alongside its U.S. Politics and Economics Daily Tracking Survey. Professional services were provided by Bowerbird Communications, Forum One, and UChicago Creative. Voices of Youth Count is made possible through a grant from U.S. Department of Housing and Urban Development’s (Office of Policy Development and Research) and generous support from other funders including Chapin Hall, Arcus Foundation, Ballmer Group Philanthropy, Bill & Melinda Gates Foundation, Campion Foundation, Casey Family Programs, Dr. Inger Davis, Elton John AIDS Foundation, Liberty Mutual, Melville Charitable Trust, and Raikes Foundation. The substance and findings of the work are dedicated to the public. Chapin Hall is solely responsible for the accuracy of the opinions, statements, and interpretations contained in this publication and these do not necessarily reflect the views of the government or any of Chapin Hall’s partners. Morton, M. H., Dworsky, A., Samuels, G. M., & Patel, S. (2018). Missed opportunities: Youth homelessness in rural America. Chicago, IL: Chapin Hall at the University of Chicago. Chapin Hall is an independent policy research center at the University of Chicago focused on providing public and private decision-makers with rigorous data analysis and achievable solutions to support them in improving the lives of society’s most vulnerable children. Chapin Hall partners with policymakers, practitioners, and philanthropists at the forefront of research and policy development by applying a unique blend of scientific research, real world experience, and policy expertise to construct actionable information, practical tools, and, ultimately, positive change. Voices of Youth Count is an unprecedented policy research initiative to understand and inform actions to prevent and address youth homelessness in America. Infused with youth voices and strengthened by nearly 30,000 surveys conducted across the country, the research provides robust information to support effective policies, practices, and programs that will end youth homelessness. More information can be found online at voicesofyouthcount.org.